Python is my favorite programming language. I’ve recently had to move a few databases from MySQL 4.x to MySQL 5.x. One of the most important differences is that the 5.x family understands character encodings. Not exactly fresh news, version 5.0 was issued in 2003, but there is still a lot of 4.x installations around. from within function “Article::pageData”. MySQL returned error “1267: Illegal mix of collations (latin1_bin,IMPLICIT) and (utf8_general_ci,COERCIBLE) for operation ‘=’ (localhost)”. However, MySQL will convert your text from latin1 to UTF-8, and your text will still appear “wrong”. You can fix it in one more step. The problem is that you had UTF-8 taken to be latin1 and then stored as UTF-8. To fix this, you need to “convert” your text from UTF-8 back to latin1, and then make MySQL take it as UTF-8, but, importantly, without converting it. This can be achieved by temporarily casting your data to binary — this operation doesn’t trigger encoding changes. You can then cast your data into any encoding you want. In a nutshell, you need to go: UTF-8 →(conversion)→ latin1 → binary → UTF-8. Assuming your system is natively UTF-8 (most of modern Linux distributions are), an easy way to simulate text garbling is the following shell expression. Again, the UTF-8 to UTF-8 conversion is preserved to make this crucial point explicit. Your string was converted to latin1, and then taken to be UTF-8. If you’re really lazy, as I am, your data has exactly this problem (UTF-8 taken to be latni1 and looking garbled), you can use a Python script I wrote. But please be careful! You’re using it at your own risk! Backup your database first! If this script damages your database and you lose all your data, it’s your problem, not mine. You have been warned. Here’s the script. Note: the script will only print SQL statements to screen. You have to execute them youself. I’ve recently checked in changes to django-phpbb, my Django-phpBB integration project. It’s now possible to authenticate users against unmodified phpBB database. I’ve also added installation instructions. Current focus will be on removing the parts that are specific to my project and making django-phpbb more generic. My current hosting provider, hosting365 register365, is a traditional-style shared hosting service, where file upload is still done via FTP with passwords sent as clear text. They provide ssh access on demand, and it has to be manually approved by company’s staff. I don’t understand why don’t they provide shell by default. Maybe it’s part of being a traditional style hosting and trying to avoid the word “shell” or anything like it. Shell they provide, but what about public key authentication? No, they don’t. As this is turned on by default in all Linux installations, they must have switched this option off. Why did they do that, remains a mystery as public key authentication is no less secure than password entry. Two weeks of waiting for it have built it up pretty much. When the phone finally rang, for some reason it felt surprising. No more waiting? Interview begins? “I would like you to dictate me some code” said the engineer. He was describing tasks and asking me to write code that solves them. They were not daunting; could be easily decomposed into basic operations. Recruiters surely understand that people get nervous when being interviewed. The fact that one is being interviewed, not “just” asked to write some code, makes them make stupid mistakes all the time. Interviewers try to give simple tasks to people. It’s also interesting that the questions were not strictly theoretical, but more like “how would you…” followed by something to find out or to calculate. It’s a list of all the possible pairs of elements. What if we want to generate a cartesian product of three sets? Three nested loops? What about four sets? What about N sets? I wanted a solution where I could give it a list of lists instead. Another example, generating a natural binary code, with the number of bits as a parameter. Please note that when you give it a very large number of bits, it will take a lot of time to execute, but it will not exhaust the memory. The project I’m currently working on is using Perl scripts. I usually use Python for scripting, but introducing another programming language didn’t seem like a good idea, so I decided to write in Perl. At first, I was struck with $all @the %decorators which make the code @$difficult $to @#read. Nothing to do about it. Next thing, a very strange way of reading function arguments. You don’t define them, all the stuff comes in something with a friendly name of @_ which is basically a lump of arguments. It’s your job to make it useful. And it isn’t necessarily easy to do. As you can see, Python code is a little cleaner, as it doesn’t have @decorators and you don’t need to surround the list with “all the weird stuff∖n” to get the list on the screen in a comprehensive form. What’s strange here is that there is no way to specify the list of arguments that the function accepts. There’s only the lumpy @_ variable which contains a list that the function was called with. You don’t actually know, how was the function called, because it could be one_list(@a) as well as one_list(‘a’, ‘b’, ‘c’, ‘d’) and you can’t tell any difference in the @_. That’s why I call it a lump. Now that we have a function which accepts a list, let’s try two lists. With Python, we can just extrapolate what we had before. One more thing in the brackets, voila, two lists ready to use. …no error message. And… somehow, @list_a swallowed the second argument, leaving @list_b empty. The two list were just concatenated somewhere on the way and function sees just one list instead of original two. Ouch. What it does, is it reads references to the lists and then uses weird @$ syntax to dereference them, er, make them usable. In this example, there are additional lines of code that wouldn’t have to be there if… well… never mind. Whatever the reason, instead of simply declaring a list of arguments, I have to wrestle with @_ and references. 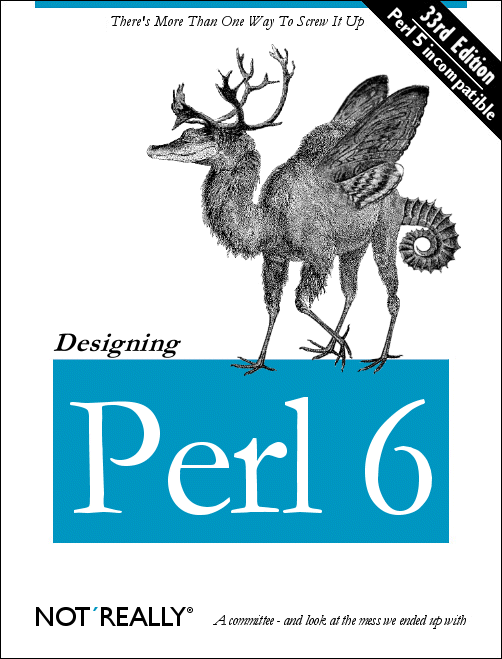 Programming with Perl looks more like something weird, geeky and obscure. It’s easy to write “Hello, world”, but one you want to write any complex data structure, references and inconsistent syntax will quickly get you down. Since data structures are difficult to handle in Perl, you will tend to write complex procedures, making your program difficult to read and understand and therefore difficult to maintain. It’s the opposite to what Eric Raymond says about handling complexity. Perl seems to be a quintessence of what I don’t like in programming languages.